Toronto is the city of festivals. A city that truly celebrates everyone and everything. We are blessed to live in a city without judgment. A city that allows all of us to smile and feel good about who we are. Toronto celebrates life and we are all so lucky to be in this city for the month of June! There is no other place in the world I would rather be than Toronto for the entire month of June. So many parties, festivals and events. People are handing out smiles left right and center and being bored isn’t an option. The team at On The Go have put together amazing summer June activities for all ages to enjoy! Do not skip a page! Our experts want you to eat, drink, play and soak up the summer sun. This is the month to celebrate your Father. Show Dad how much you respect, care, love and adore his guts. Remember that there is no “How to be a Father hand book” so be the bigger person and celebrate him — celebrate your father for bringing you into this world. Without him there is no you! And YOU are pretty fantastic! Starting June 12th 2014 FIFA World Cup Brazil takes over the city. Fan or not, this is an exciting month to watch and applaud your team. My patio pick of the month is Jazz Bistro’s 3rd floor lounge and patio “the Jazz Cellar”. A tucked away gem in the Yonge Dundas corridor, the Jazz Cellar sits atop of 251 Victoria Street the home of the Jazz Bistro. Opened one year ago, the Jazz Bistro offers live music six nights a week and Sunday brunch. Chef Brad Macdonald has crafted a modern bistro menu with locally sourced, seasonal produce complimented by his signature breads and desserts produced in house daily. The third floor lounge and patio, the Jazz Cellar, is the perfect spot for after work drinks, a quiet dinner under the stars or dancing on DJ Thursdays and Fridays. Strategically placed TV screens let you watch our Blue Jays in action or cheer for your favourite world cup team. The Jazz Cellar is available for private events — call 416-363-5299. www.jazzbistro.ca. for artists to come create, share and play. Arts & Crafts Field Trip is back for its second year of music, art & food at Fort York & Garrison Common. Featuring Interpol, The Kills, Broken Social Sceen, The Constantines and a dozen more! Pants Off for Prostate Cancer is an edgy and innovative fundraising event that puts the focus on the below-the-belt nature of prostate cancer by enforcing a mandatory no pants policy at the door for its guests — a diverse mix of Toronto’s professional crowd. Since 2010, the annual event has drawn crowds of over 400 people — all pantsless — in efforts to raise funds to benefit Prostate Cancer Canada, the nation’s leading charity funding prostate cancer research, support programs, and awareness. The action all takes place at The Hoxton (69 Bathurst Street — at King St West). The biggest stars in the world walk the red carpet on Queen Street. Hosted by the Kardashians this year this will be one massive outdoor celebration of music and entertainment. You can watch at home or be a part of the action. Every night club in the Entertainment District will have some kind of after party. Go online and check out where the action is! It is a city wide party! you are! The biggest acts in the world will perform free live concerts all across the city and the world will be watching Toronto shine! The World Pride Committee and Tourism Ontario have created programming for everyone to enjoy. The party shuts down the city on Sunday June 29th for the World Pride Parade! Over 2 million people are expected to fill the streets of Toronto from St George and Bloor to Dundas Square! We are so blessed to live in a city that accepts everyone for WHO they are! If you have never been to the Pride Parade — I suggest you bring a water gun to keep cool and join the action! It is a very interactive parade and the only rule is to smile, love and dance! And of course show up being PROUD of who you are! For all events information and locations check out www.worldpridetoronto.com. Enjoy smooth sounds from jazz local and international musicians during this week in June. Sample some of the best finger-lickin ribs Toronto has to offer at the Ribfest in Etobicoke. 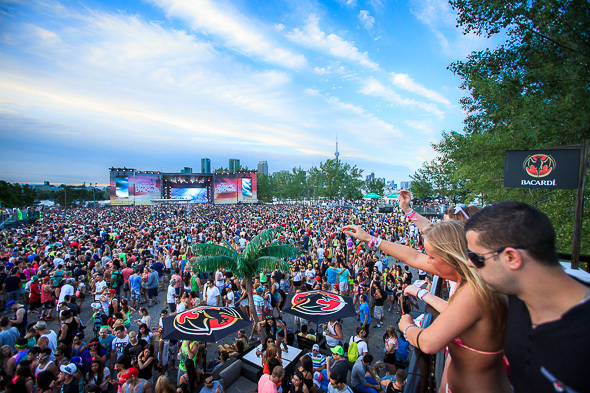 Canada’s largest EDM festival is bringing Tiesto, Justice & many more to the Flats at M.C.A. … DANCE YOUR GUTS OUT!!!! I really don’t care what you do this month as long as you are having fun! Summer is here! Stay outside and wiggle. Wiggle with the birds, wiggle with strangers. The number one song in the world for the last few months is Pharrell Williams’ HAPPY! June is here, clothing optional, just be HAPPY! PS — A big THANK YOU to The Amazing Team at PROUD FM for an amazing 5 years of fun! The Evanov Radio Family has been such a joy to work with! The Mike Chalut Show will be on a new station, new time and produced by a new family! STAY TUNED … The Last Day of The Mike Chalut Show on PROUD FM will be June 29th 2014! by Jessica Panetta | With the wrap-up of World MasterCard Fashion Week, I thought it would be beneficial to talk to an individual who is immersed in the fashion world of our city and beyond. Spiro Mandylor, founder of the Toronto blog It’s All Style To Me, took time out of his busy schedule to sit down and talk fashion with me. His perspective on fashion is not what you would expect from someone who has been surrounded by it for most of his life (i.e., he believes the award for overrated style goes to Kim Kardashian, Kanye West, Pharrell and First Lady Michelle Obama). When It’s All Style To Me was launched, it was not solely about meeting designers and celebrities; it was about developing his writing and engaging his audience with brief fashion and style reviews for the busy professional. Spiro takes aspects from diverse parts of his life and incorporates them into his blog. He is a photographer, an artist, a marketing maven, an IT expert and if I may say so, a stylish individual. about the upcoming trends and regards designers Joe Fresh, Pink Tartan, Mikael D and Michael Kale as ones to watch for 2014. Spiro’s final thoughts: like it or not, we are all into fashion, even trends; since what is available in stores and online, on some level, dictates what we wear. Ladies, do not wear tights as pants because it is lazy and distasteful. Men, get rid of your square-pointed shoes; and everyone should dress age-appropriate. on E!’s Celebrity Style Story.